Majestic, superb, awe inspiring, just some of the discriptions of the road leading down to Milford Sound from Te Anau, “a destination in itself” screams another guide. Expectations sky high we set off Saturday morning in clear hot sunshine. We had been warned if we wanted to avoid the plethora of tour busses we should leave after eleven so we treated ourselves to a late breakfast, in my case, of a huge raspberry and cream cheese muffin, the New Zealander’s seem to like cheese in everything. 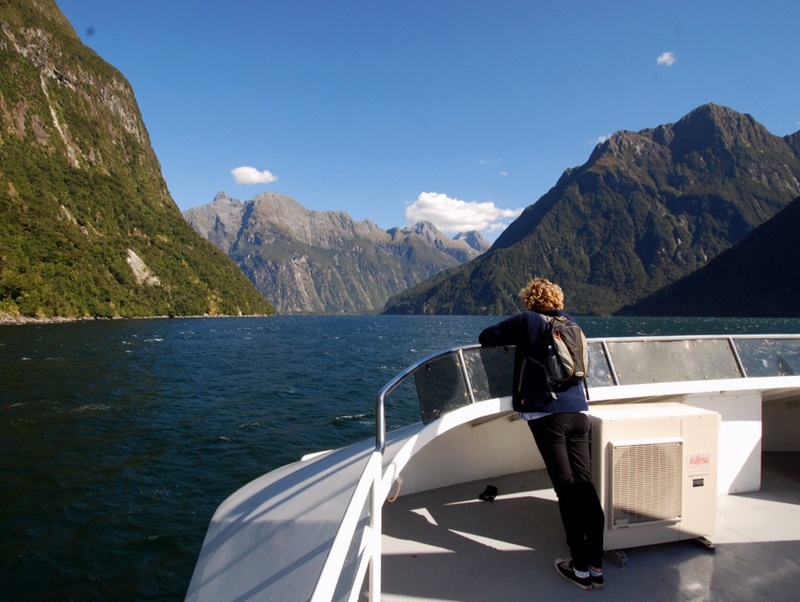 The route started along the picturesque shore of Te Anau lake at 65km long and 340m deep it is he largest of the Southern lakes and created, as all the lakes and deep U shaped valleys here, by the huge forces of ice age glaciers. Gradually climbing, the road turned away from the lake and we entered dense woodland. 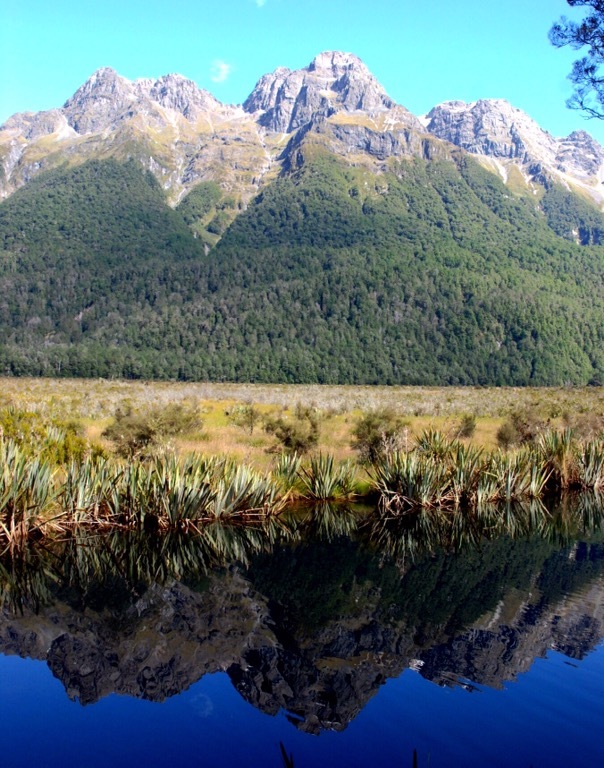 The trees high on each side of the road would suddenly clear to give spectacular views of snow capped mountains, wide valleys of tussock grass or fast running babbling brooks. As we climbed higher the trees thinned out and the sheer, bare mountain sides became streaked with waterfalls. 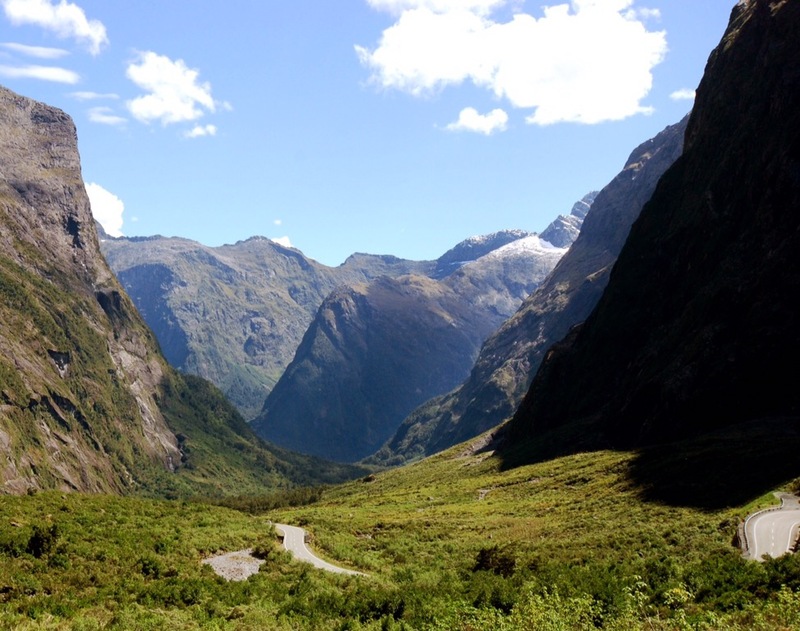 To make Milford Sound accessible by road, in the 1960’s, Homer tunnel was carved through the bedrock, a single lane of tarmac takes you through the dark, dripping centre of the mountain. You emerge into an immense gully, walls of stone guide you the steep, final ten miles down to the coast. The road down towards Milford Sound. Then as you round the final bend you are greeted by – carparks, three large bustling carparks full with cars and camper vans, the view of the Sound somewhat diminished in the background. 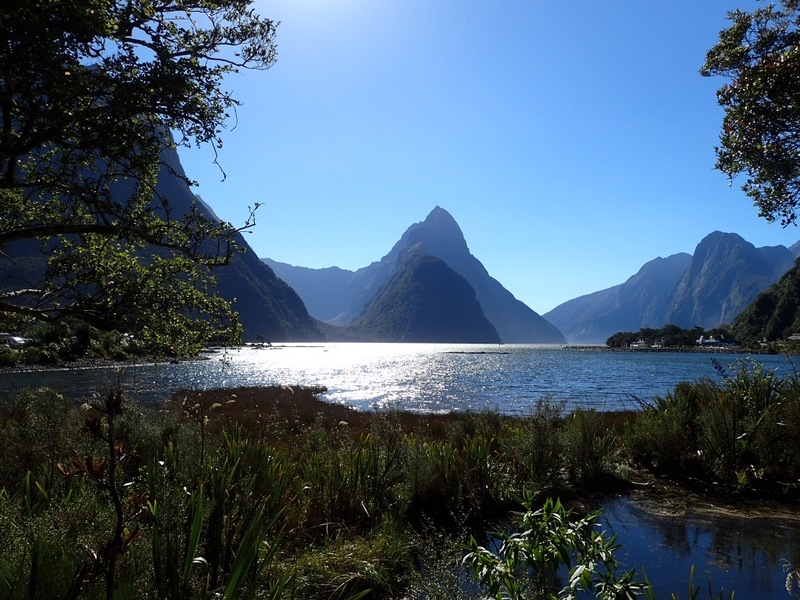 But like everything here, there is no need to worry, it’s all organised, take a few steps down the well thought out walkway and there is the iconic view of Mitre Peak that Milford Sound is famous for. The only way to see the Sound properly is from the water so we signed up for one of the many cruises. We wound our way out through the narrow opening, dominatining cliffs two thousands meters high either side of us, eventually out into the Tasman sea. From outside the overlapping peaks completely hide the entrance and Captain Cook, unusually, missed the opening twice as he charted the area. It wasnt discovered by a European until 1823 when a sealer, searching for shelter from a storm, sailed inside, naming it after his home town of Milford Haven in Wales. Apparently it rains here two out of three days so to be cruising in bright sunshine was a rarity, the furs seals basked enjoying the warmth on ledges above the water, looking tiny against the enormity of their backdrop. The humans just gawped in wonder at the scenery around them. And we still had the two hour majestic, superb and awe inspiring drive back to our hotel in Te Anua.